Apparently, updating a nail blog is next to impossible when you work 14 hours a day. I've also launched a personal blog, Whimsy & Wanderlust, like I don't have enough to do. But anyway, I do my nails now when I can—which includes squeezing in a manicure while visiting my mom and grandma. Without any of my usual tools and polishes from my nail polish kit, I attempted to do a gradient. Surprisingly, it turned out halfway decent, using a hodge podge of colors I found in my mom's stash. I started with a single coat of OPI Alpine Snow. It doesn't matter if it's not opaque; I just use it to brighten the color of the gradient, since it's done without a brush. After that, it's time to start the gradient. 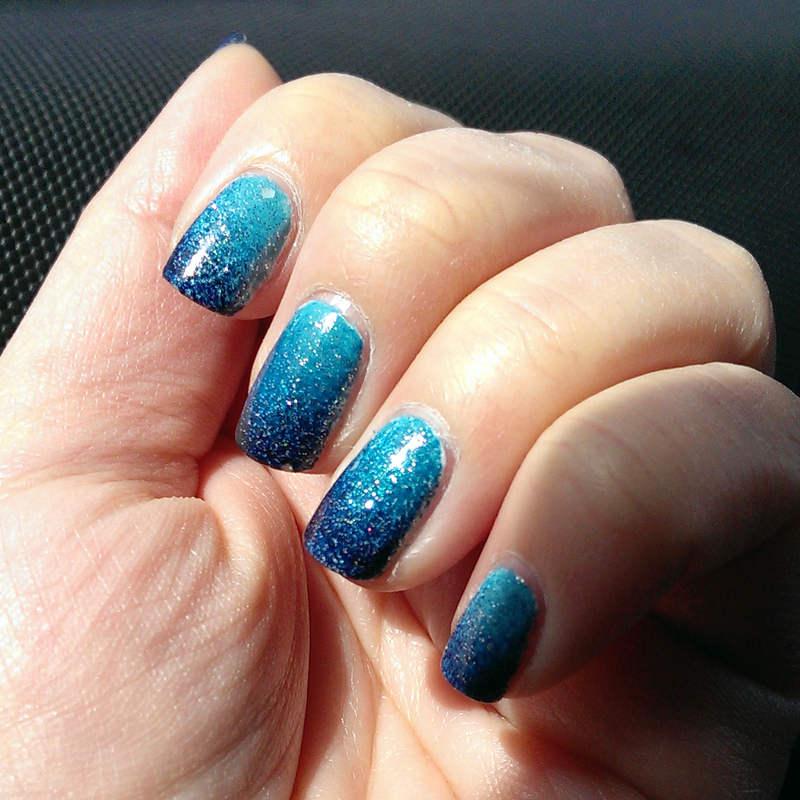 On a paper plate, I lined up drops of OPI Can't Find My Czechbook, OPI Yodel Me On My Cell and Cosmic Love from Ulta's Shine On holiday mini set (the dark blue with hex glitter). Instead of my usual makeup sponge, I used one of my mom's sponge brushes. It made a mess—I don't recommend it unless you don't have any other options. On the bright side, it did give the gradient a really cool texture and depth. I finished it off by adding a light coat of OPI Pirouette My Whistle, a fine glitter that has some hex pieces in it.